CFOs today face an ever-lengthening to-do list. The demands of the global and digital economy have multiplied the finance team’s responsibilities to areas far beyond its traditional scope. 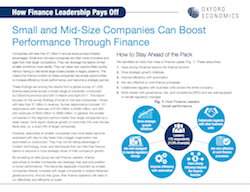 Executives must balance their traditional finance activities, such as optimizing working capital and risk management, with the strategic mandate to accelerate innovation and evolve the business model. Some organizations are better than others at this juggling act. To ensure your organization is better make sure to download and read this today!